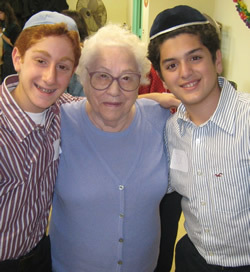 As Holocaust survivors age, it becomes more difficult for them to lead active and social lives. They may need help with chores or just feel lonely. Volunteers help by visiting a survivor for one hour each week. During visits they assist with shopping and organizing, discuss the news, tell jokes and trade stories. Originating from Europe with a fascinating and diverse history to share, survivors relate invaluable insights and experiences to our volunteers. Each volunteer is carefully paired with a survivor with whom they can connect. Connect2 matches volunteers with survivors based on location and shared interests. Visiting schedules are adapted to the mutual convenience of the survivors and volunteers. Volunteers gain enormous satisfaction by seeing how much the survivors appreciate their help and company.